Very helpful staff. We stayed in little apartment so we could make cups of tea and breakfast. Good location but that brings noisy street sounds with it at times . 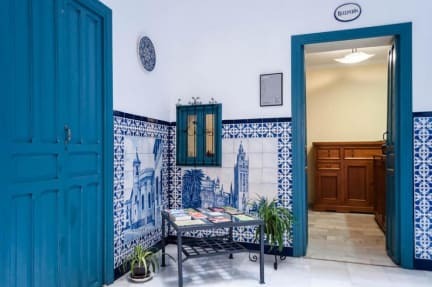 Absolutely beautiful hostel nicely located in the centre of a fantastic city. Like everything else in Sevilla, the hostel had an antique chic that really elevated it to feeling almost like a mid-priced hotel. Staff were friendly and helpful. Can't think of anything to complain about! The hostel was wonderful , really clean and cozy , the location is also ideal immediately next to the city centr . I used to walk 10 minutes to reach the cathedral , and it was a pleasant walk . What disturbed me , however , was the noise in the hostel . The walls are really thin and I could hear everything my neighbors were doing (all night ) and they woke me up at 6 in the morning almost every night when they came back drunk and started yelling on the halls . I didn’t rest too well. This place was very affordable for our group of 6 adults and one child. It was a homely atmosphere, and very secure. The only minor issue was that only ONE set of keys was provided, and they weren't able to provide another. The group of apartments are behind a main iron gate which is only accessible with the key from the inside and outside. So basically, anyone without a key is either locked out or locked inside the apartment block. Great location, very helpful and friendly staff. Simple rooms, basic facilities but would benefit from more communal resources.....somewhere to make tea/ coffee/ prepare fruit etc.... maybe provide a small breakfast. Good value for money. Clean. The terasse was amazing and the spot was perfect (near the main monuments). A bit noisy at night. Room was very little (the size of the bed and that's it) so we had to put the luggages under the bed. For backpackers, maybe not the best option because there was no kitchen available. One other thing : out of the 4 nights we were there, we missed toilet paper for 3 nights so... Maybe be more vigilent about that. But in general, I would recommand ! 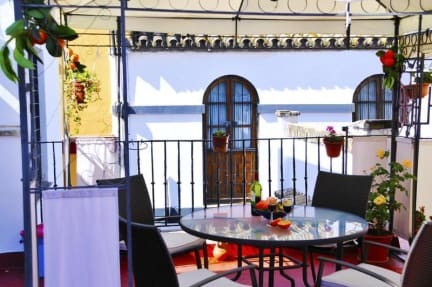 We stayed for two nights at Pension Montorena. The location is good, staff is okay, but the bathrooms were really dirty. Terrible. The wifi didn't work AT ALL in my room. The woman made ZERO effort to try and fix this when I brought it to her attention twice Only cold water in the shower. They charge extra if you want to use the air conditioner in your room, but don't tell you that when you book. Find someplace else. There are many better and more conveniently located places to stay.